Italian Deputy Prime Minister Luigi Di Maio said on Thursday his party would vote to suspend funding to the European Union next year unless other states agreed to take in migrants being held on a coastguard ship in Sicily. Three days after Italy's Diciotti coastguard vessel docked in Catania, 150 adult migrants remained on deck. After seeing hundreds of thousands of sea arrivals in recent years, Italy wants other EU countries to accept them. The European Commission has said repeatedly this week that it is working to find an agreement. Other such deals were found in June and July for ships carrying rescued migrants that docked in both Italy and Malta. "If tomorrow nothing comes out of a European Commission meeting on redistributing migrants from the Diciotti ship, the 5-Star and I will not be willing to give €20 billion each year to the EU," Di Maio said in a video posted on Facebook. Di Maio is the leader of the anti-establishment 5-Star Movement, which is in a coalition government with the far-right League and its leader, Matteo Salvini, who has championed a hard line against immigration since taking office in June. Di Maio said he agrees with Salvini's position that the migrants should stay on the ship until there is an agreement in the EU, a day after the 5-Star speaker of the lower house of parliament criticised Salvini. Salvini, who is also interior minister, was defiant on Thursday in the face of a criminal probe into possible kidnapping charges for forcing the migrants to remain on the vessel. 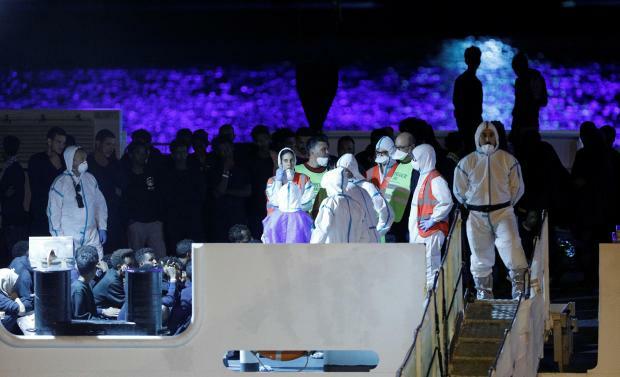 The chief prosecutor from the Agrigento court, Luigi Patronaggio, on Wednesday boarded the Diciotti and said afterwards he had opened a probe against "unknown" persons for holding the migrants against their will. "There's a court that is investigating whether those illegally on board the ship have been kidnapped," Salvini said in a radio interview. "I'm not unknown. My name is Matteo Salvini... I'm the Interior Minister and I think it is my duty to defend the security of this country's borders." A public backlash against the arrivals of hundreds of thousands of seaborne newcomers in the past five years helped put Di Maio and Salvini into office. Salvini allowed 27 unaccompanied minors off the ship late Wednesday. Humanitarian groups - including the United Nations refugee agency, the International Organization for Migration (IOM) and Doctors without Borders - on Thursday renewed calls for the migrants' release from the vessel. "Migrants who arrive from Libya are often the victims of violence, abuse and torture, and their vulnerabilities should be quickly and adequately identified and dealt with," IOM Italy mission head Federico Soda said in a statement. A Doctors without Borders psychologist said in a video that she had spoken with the minors who left the ship and they said they had spent more than a year in detention, where they were abused and mistreated. Two cases were more critical, she said. One boy was having trouble seeing because, he said, he had been locked up for a year in the dark. Another had a gunshot wound in the shoulder.